欸...我們看兩行就夠了 UPDATE [dbo]. [TPAPQB01]SET [GsmpPtIndex] = 'PAP_0001' WHERE [GsmpPtIndex] is null; UPDATE [dbo]. 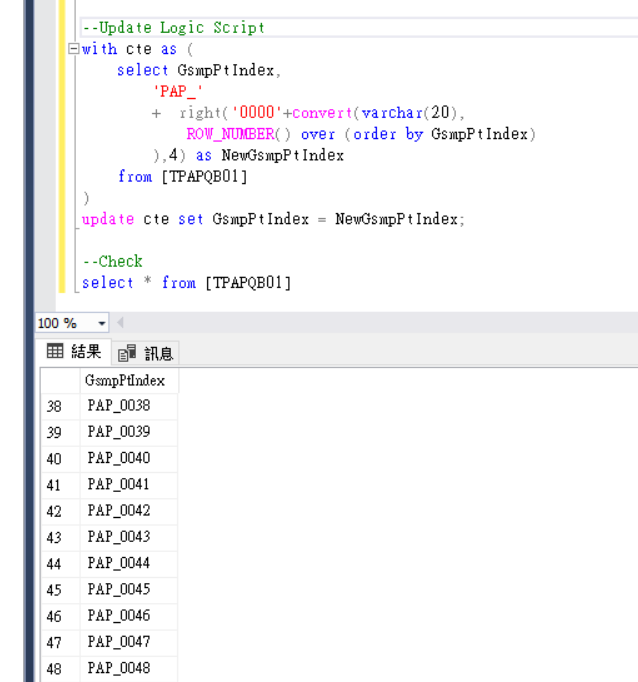 [TPAPQB01]SET [GsmpPtIndex] = 'PAP_0002' WHERE [GsmpPtIndex] is null; 開始前: | GsmpPtIndex | | null | | null | | null | 執行了第一行: UPDATE [dbo]. [TPAPQB01]SET [GsmpPtIndex] = 'PAP_0001' WHERE [GsmpPtIndex] is null; | GsmpPtIndex | | PAP_0001 | | PAP_0001 | 第二行當然沒用啦，因為已經全部都不是null了! "不要拿sql當程式設計用。sql並不會一筆一筆跑的。" 不太理解你這說法是?? 什麼情形下 SQL 不會一筆一筆來跑呢? ?